The other day I was out driving around, stopped at an intersection and began looking around in the interminable wait at the red light. To my right a small car pulled up next to me and the driver had his finger two knuckles deep in his nose. There was no shame from him. He didn’t glance in my direction and slowly pull it out with a sheepish grin on his face. No, he kept digging. So I turned away, having already had my fill of that view, and saw a woman in the crosswalk in front of me wearing a cheetah print jacket with zebra-striped pants and a pink boa (and, no, this wasn’t in one of THOSE areas of town). She clutched a sequined gold bag in her hand and had hair that must have towered ten inches above her scalp. As she sauntered across, she was almost run over by a huge, ape of a man in a rusting Dodge pickup truck he was directing left. In his lip was a huge lump of chew and he was about to spit when he suddenly saw the woman and slammed on his brakes to keep from hitting her. He muttered something which I couldn’t hear and doubt would be repeatable before letting her through and then recommencing his turn. This all happened in a matter of a minute and, as my brain processed and filed it all, I couldn’t help but wonder where in the world I was! Disbelief that this all was right in front of me, in the relatively normal place where I was, seemed just as relevant as disbelief that there are people so strange in this world. But some people are just weird. Right? I don’t mean “peculiar” or “different,” but actually weird? True, maybe the word “weird” isn’t descriptive enough nowadays to fully handle what we see around us? It now seems too commonplace for what it describes. I think it’s been applied to things so ordinary and routine as to almost lose its punch and our language is poorer as a result. Are we just applying less and less stringency to what actually qualifies as weird? Maybe so. After all, it wouldn’t be the first time that we’ve used a word so flippantly that we erase any meaning from its definition. Having used the word “awesome” to describe many a burrito, or shot on goal in soccer, I’m as guilty as anyone of it. But I digress. The point for this post is that the word doesn’t seem to do justice to just how strange and peculiar and inexplicable some people are. And no, I’m not talking about weird people who are only weird to us because they come from a different culture or even a different demographic background from us. Some of those from diverse cultures and backgrounds are more normal to me than someone who grew up in the same cities and circumstances as I. I’ve met people from Fiji with whom I had more in common than a kid who went to the same school as me. Instead I’m talking about those people who truly do bizarre things. I’m talking about those who like curious likes and derive joy from baffling sources and respond to normal things with abnormality. Why do they do and like and love such things? No one can tell. And that’s why they’re truly weird. What’s more, they often don’t even realize that they are weird. With the internet opening avenues for communication regarding who-knows-what, there’s always a community that seems to develop around a mutual interest in the weirdest things. But what’s really intriguing is that even if one were to walk into a convention full of people gathered to talk and experience all things gelatin-related, or to glory in a mutual love of the chinchilla, inevitably one would notice that that assembly would still have some who wouldn’t quite understand one another. Sure, they’d be able to talk for hours about their shared admiration for the banzai tree or to debate with one another about the merits of tying one knot instead of another, but once topics moved out of that peculiar sphere their paths of weirdness would estrange them from one another pretty rapidly. To be perfectly honest, as long as the weird person is harmless (or should I use the term, “tame”) I generally really love their eccentricity. Life would be pretty boring without your neighbor’s obsession with large snakes or your cousin Jimmy’s affinity for gourmet Mac ‘n Cheese or your Uncle Lanny’s Civil War Memorabilia collection. Perhaps the greatest treachery an attitude of exclusivity can foist upon us is the corollary: I am normal. When we view everyone else as bizarre, aren’t we implying that we are normal? But what is normal? Is there such a thing as lack of peculiarity? A lack of weirdness? My response to this is a simple, “No,” if we are talking only about purely physical things like a love of breeding gerbils or making homemade sausage (hopefully gerbil-free sausage). However, if we load onto the question the greater importance of spiritual things, then my answer becomes an unequivocal, “Yes!” The reason I’d be so explicit is that a Christian differs so much from a person of any other faith or creed that, by comparison, everyone else is astoundingly and boringly “normal.” We, as Christians, are complete and utter weirdos in this world. Now, I realize that if you asked an atheist, or even a Jew, Buddhist or Mormon, whether they thought Christianity strange, peculiar or weird, they might certainly respond with a yes. But if you asked them more pointedly whether they thought individual Christians strange, they might just as easily respond that we’re boring – rather homogenous and innocent. Honestly, I might agree … within reason. God has called us to be pure and to love others; which I suppose to an outsider might seem very limited in excitement, precluding anything that might be considered “exciting” or “fun” or even “interesting.” Christians aren’t to be drunkards or philanderers or even to view our wealth as our own – therefore we are not to only use our wealth to have fun and seek exhilaration. To the world, this could make Christians look like they’re missing out on things. They might see the religion as one which makes its adherents stodgy and stale, bland and timid, repressed and under-expressed. However, in a world where the faulty decisions made by the unanchored worldly man or woman bring pain and uncertainty to their lives, is it boring for the person who is anchored by Christian principles when they thus aren’t confronted by the results of cheating or corner-cutting? I’d say “boring” isn’t the right word, “freeing” is more appropriate. Since when does adding unnecessary drama, ache and failure equate to excitement or exhilaration? More importantly, if one looks at the possibilities and alternatives open to the person who is committed to humanism (in any of its forms), or to another religion, one sees something extremely unsettling: the options are only between dread now or dread later. There is no such thing as a decision without punishment. One either punishes himself with deferred enjoyment AND ultimate consequences (if he believes there are any), or take the fruit from the garden and bite into it with relish, consequences – now or later – be damned. And the reason I lump other religions with humanism into that set of options is because all other religions hinge upon how well a person can measure up to an ideal: a Jew must keep the Torah and the Talmud, a Buddhist must seek enlightenment through continual personally-conducted regeneration, a Mormon must go through all the rites of the church and woe to the one who doesn’t tithe properly throughout his life. You see that when salvation relies upon man, failure is not a matter of if, but when. It is the failure in rite that leaves one wrong. And, whether life is lived for oneself or by oneself, failure stalks and pounces as inexorably as a hungry beast upon helpless prey. Both the humanist and the oppressed young man or woman who grew up amidst a works-based salvation see the situation clearly and ask, “Why bother?” The humanist asks it because he has no other choice and the legalist asks it because he is being realistic. The humanist asks, “Why bother trying to be good if there is no ultimate consequence?” The legalist asks, “Why bother if I can’t be good enough anyway?” The humanist asks, “Why bother even trying to define what is right if I’m my own reality?” The legalist asks, “Why bother denying myself the pleasures of life if I’ll fail in the final test anyway?” Frankly, I don’t blame these people for having an “eat, drink and be merry” type of philosophy. Either way, doom is at hand and inescapable … why prolong it? Which means that I must ask: If there is no difference in outcome between the one who lives exclusively for his own pleasure and the one who must rely upon their own perfection for salvation, why would we not see that it is those whose hope is Christ – His shed blood and substitutionary death – which are the weirdos in this world? The normals are the ones who dread; the weirdos are those who hope. The normals rage against the perceived injustice of time; the weirdos embrace age and welcome the end as they go to meet their Savior. The normals seek meaning amidst fleeting pleasures; the weirdos see joy amidst pain. The normals, having only the untrustworthiness of themselves, feel isolation; the weirdos enjoy the presence of the sanctifying, stalwart Spirit. The normals break under the pressures of life; the weirdos break but are then re-forged to the glory of the Unbreakable One. The normals seek justice by their own terms and are still found guilty; the weirdos bow to the sovereignty of God and receive His grace. This isn’t normal. 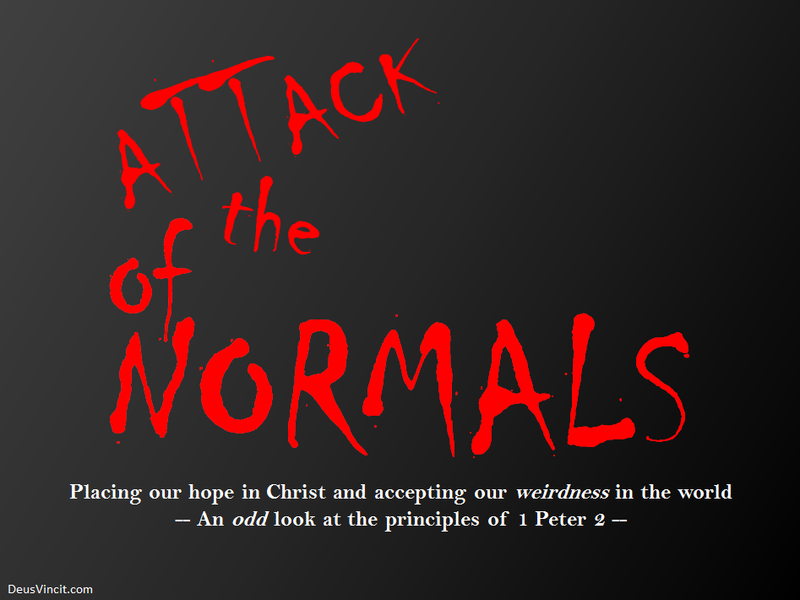 We Christians aren’t normal. We are considered “fools” (1 Cor 3:18) by the world. We are looked down upon and slandered. The very best we can hope for from those who are perishing is some sort of misguided bit of pity or amused admiration as we – in their view – waste away in our attempts to be pure for a useless purpose. We are beyond peculiar; we are “aliens and strangers” (1 Pet 2:11) in this world. Everything we do and desire, if focused upon our hope, is weird to those who are lost. You see, in the end there really are only two types of people in this world: those in Christ and those who aren’t. In spite of our peculiarities as humans, not to mention eccentricities, the only way to really make sense of mankind – or life in general, for goodness sake – is in defining it by Christ. When we were dying in our sin, our only choices were evil. You can’t choose good (except by accident, I suppose) when you are depraved. So you might only choose between a bad thing and another bad thing. It takes God coming into our lives and revealing a foreign, alien, weird option to us. Good is not natural to man. Therefore, when a man accepts that foreign, alien, weird option, God begins to work in him something which makes that man himself foreign, alien and weird. The instinctive drives and desires of the natural man are blunted and rolled back. The choices are no longer between evil and evil. Good becomes an newly available option. Good can be done because the weird man actually desires good. Most importantly, good can be done by the weird man for God’s sake. The one who grew up in a religion which placed all hope on what one does, now rests his hope in Christ and is freed from the slavery to checklists and laws. And the one who never acknowledged God because in Him he saw only slavery to dogma, when confronted with forgiveness transcending this world he now sees the slavery of life without grace. So yeah … I’m a weirdo too. Certainly I’m different from an unapologetic, public nose-picker, or a flamboyant dresser, or a rampant tobacco-juice spitter. But a weirdo nonetheless. My hope is in Jesus. He is my reason for life, my reason for love, my reason for joy, my reason for taking each breath. And, what’s more, I want to make Him happy. I want Him to be glorified in what I do, in what I say, and in what I am. I pray that He will fix my evil ways, and continue to transform me into His likeness … and I’ll gladly take the label of weird that comes with it. His weirdness seems much more preferable to me than the normalcy of this world. Therefore, rid yourselves of all malice and all deceit, hypocrisy, envy and slander of every kind. Like newborn babies, crave pure spiritual milk, so that by it you may grow up in your salvation, now that you have tasted that the Lord is good. Now to you who believe, this stone is precious. But to those who do not believe, “The stone the builders rejected has become the cornerstone” and “A stone that causes people to stumble and a rock that makes them fall.” They stumble because they disobey the message – which is also what they were destined for.